Full or Part Time with Broker/Mentor Al Lewis. 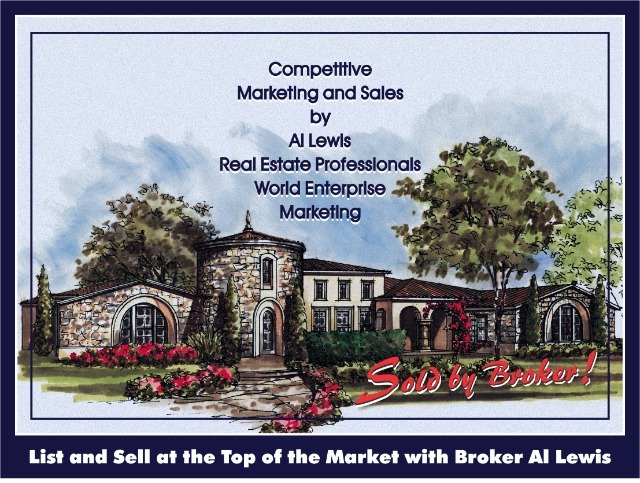 Broker/Mentor Al Lewis, marketing professional since 1975, seeks licensed agents for full or part time listing and sales activity under the banner of Real Estate Professionals Allstate Marketing for "Top of The Mark" listing and sales activity at any price point: from under $1/Million to over $10/Million. Go straight to the top at any price point in your local market or reach out to high-end sellers wherever located. Master the Forces that Shape Success / Learn Broker's secret formulas for out-listing and out-selling the competition at all price points. Grow status and wealth in real estate by controlling the inventory within any locale, community or city desired. Learn to out-list and out-sell the competition by being the competition in an authentic co/marketing, in-field, in-house mentor/mentee relationship with broker/mentor Al Lewis. When success gained in the field working with buyers and sellers grows your confidence and ability to the point where you act independently in all ventures we will break the co/marketing partnership, raise your commission, and loose you on the world. Broker Seeks Marketing-Partner/Protégés, Associates and Affiliates / Work at arm's length in-field, in-houses with an experienced Broker, a forty-year vet that has listed and sold at every price point within the southern California market and, even, has sold hundreds of whole projects for builders in southern California acting as both the Advertising Agency and Broker of Record for the building trade clients. It is the object of Broker's mentor/mentee program to help Marketing Partners, Protégés, Associates and Affiliates go straight to the top and stay there, though it is not necessary to have that kind of ambition to work with Broker. Whatever your interest, a moderate income and work ethic or high income and striving, your needs are welcomed and will be met here. Call on Broker any time to discuss the different designations. List and sell with ease at any price point by utilizing Broker's secret formulas, unique seller services and leadership within a true mentor/mentee relationship. You will bypass the typical two-to-five year trial and error period most agents go through to just figure out how things work; you will, instead, start at "Success" and stay there. Start at The Top / Success, it has been said, is found on the far side of failure, you will bypass that curve completely (1) No down time sitting through endless hours of high-cost in-office training (2) No high-cost farming (no farming) (3) No dragged out business development program (4) No buying of leads or bench ads, or magazine ads, or online profiles on Zillow or Trulia or dot.Realtor or Realtor.com (5) No Google Adwords, Yahoo or MSN pay-per-click advertising campaigns (6) No high-cost website or website optimization schemes and (7) No telemarketing. You will bypass these things completely, yet have moderate to high-end listings on the market by the end of your first month working with broker/mentor Al Lewis and every month after if wanted. You will start at the "Top" and stay there. Top of The Mark Real Estate / At this point you must be asking yourself how this is possible; how you can build a career in real estate listing and selling at the top of the market or any other price point without doing the things everyone else does; how this can be done nearly cost free and within only thirty-days of starting. (1) Top Producer Listing: The UnConventional Farm, if you seek to out list and out sell the competition at prices under $1/Million within any locale, region or city. (2) The Power of One: The Top Job in Real Estate, if you seek to list and sell at the top of the market: prices ranging from $1/Million to $10/Million or more. No REOs / No Short Sales / No NODs / No Loan Mods / Though stated as a job, real estate itself is not actually a job at all, it is an activity. Specific activities produce specific results. It is not important whether you work only a few hours a week, twenty-to-forty hours a week or more. What matters is what you do when you work. Conventional real estate organizations including the franchise giants do their best to rubber stamp each of their associates into activities built around principles of sales that make more sense for the growth of the company than for the success of the agent. That's why thousands of people begin and quit real estate every year even though a career in real estate can be very exciting and a sure road to status and wealth for anyone that wants it. Being in a listing program that works is job one. We at Real Estate Professionals Allstate Marketing do not chase REOs, Short Sales, NODs or Loan Mods, instead we seek high quality equity-positioned sellers (listings) at any price point within the market that you choose to work, from the low- to the high-end. A listing agreement is a very valuable document. It should be thought of as more than an agreement between a seller and agent for the marketing and sale of a property. It should be thought of as a note and deed of trust against a property executed by its seller in favor of the listing agent. It is in essence a form of property ownership or equity position with no money down. Property ownership has long been the defining element of status in society: with it you have power, without it you don't. In real estate, listings represent property ownership. Agents with listings consistently earn more money than agents without listings and are held in higher esteem by their colleagues, family and friends than are agents without listings. Listing is "Job One." Think Big / To be successful you've got to be structured and focused in your work. There must be direction and purpose in your words as well as performance guarantees and viability in your programs. You've got to have a positive attitude and a successful image. We often hear someone say there are no shortcuts to success, but that’s not true. There are shortcuts to success. They come in the form of the leadership you submit to, the company you keep, the tools and tactics you use: one way versus another. Broker/Mentor Al Lewis is the lead trainer for Real Estate Professionals Allstate Marketing and we, as a team that includes you, have a mission. We are dedicated to helping each of our associates achieve their first $100,000 year if that is a threshold they have not yet crossed, then their first $300,000 year, then their first $400,000 year, and then their first $500,000 year working mostly part time from a home-office. In the long run we expect the income of each associate working with us to exceed $1,000,000 per year. That is, after all, only ten $100,000 commissions or twenty $50,000 commissions a year and this we can do provided we focus our efforts listing and selling at the "Top" of the market. By working from a home-office we are able to avoid activities which often do little more than waste our time: the maintenance of office hours, for example, as well as office meetings can be time wasters; but floor time, caravanning and relentless farming are the worst offenders. Success “for Life” in real estate will not occur unless your career is built around activities that allow you not only listing and sales success, but time for life itself. We all have a personal life, a family life and a business life. Often, the career paths we choose demand too much of us, take too much time away from one area of life to build another. That cannot last and leads ultimately to a breakdown here or there. Success “for Life” is possible with balance if we just work a plan that allows it. Structures unique to the Real Estate Professionals' program fill the needs for lead generation advertising, floor time, marketing, desk, phone, identity, support, camaraderie, insurance and training with “Balance” in mind. Get to Where You Want to Go Quickly / We've all heard the phrase Quantum-Leap, but have you ever wondered what that actually means? Although the phrase quantum-leap has become common in everyday conversation, it actually has a very specific meaning. When we are taught about atoms in school we are usually told that there's a nucleus that contains protons and neutrons, and that electrons circle the nucleus in fixed orbits or shells that vary in distance from the nucleus. We are told that electrons stay in one particular orbit, but sometimes change to a different orbit. If an electron absorbs energy it can jump to a higher orbit, if it releases energy it can drop to a lower orbit. What most of us are never told is that when an electron changes orbit it does not move through space or time to arrive at its new location. Rather, an electron at one moment is in orbit A, and in the very next moment it is in orbit B, without having traveled through the space in between. That is what is meant by a quantum-leap. A quantum-leap is a change in status from one set of circumstances to another set of circumstances that takes place immediately without passing through the circumstances in between. Even life's daily events are governed by this principle (believe in the possible). Join the Real Estate Professionals' team and make a quantum-leap in your career now. Start at the top by working side-by-side an active hands-on listing and selling Broker within a true Journeyman/Apprentice (or Protégé) relationship. Then advance to Journeyman status and independence at your chosen speed. To explore the Real Estate Professionals' program and tactics, and broker Al Lewis' range of expertise and experience, visit the links and websites shown on the sidebar to the left. A real estate license is required and, if you choose to apply for a position, it is expected that you have a competitive presentation (fashionable grooming, style, and appearance), personality, vitality and an action oriented work ethic. Introductory Meeting / To learn exactly (1) How the Real Estate Professionals' listing and sales program works (2) To determine your fit (3) To learn why it is recession-proof, free of competition and "Top of The Mark" you are cordially invited to call on Al Lewis direct for an introductory meeting and personal interview. Please visit all the links and websites shown on the sidebar to the left prior to calling. Working with Al Lewis you will have the -- Top Job -- in real estate substantiated by a lifestyle exemplifying balance and an income exemplifying wealth and status.